Sleep on your left side. This allows for the best blood flow to the fetus and to your uterus and kidneys. Try to avoid lying on your back for extended periods of time. Try using a special “pregnancy” pillow to help you sleep better. If you are experiencing leg cramps you may want to avoid carbonated sodas and drinks. If you start snoring, have your blood pressure and urine protein checked—especially if you have swollen ankles and headaches. If you develop Restless Legs Syndrome, you may want to talk to your health care physician about an iron deficiency. If you can’t sleep, don’t lie in bed forcing yourself to sleep. Get up and read a book, write in a journal or take a warm bath. If you get a cramp in your leg, straighten your leg and flex your foot upwards. Try doing this before going to bed several times to help ward off future cramps. After the first trimester, when I was constantly in a state of nausea, my pregnancy has been pretty uneventful and not all that uncomfortable. I did, however, find that sleeping comfortably was difficult from early on unless I took some measures to help myself. I would often get hip pain, and just a general feeling of discomfort if I didn’t have the proper support; so using a pregnancy pillow was one thing I knew would help me. There are lots of pillows on the market, but I was able to try out the Boppy® Custom Fit Total Body Pillow. The reason I really like this pillow above all others is that it is customizable. You can adjust how you want to use it because it has three separate pieces. You can choose to use the pieces separately as needed, or attach them and use as one large pillow. I do find that my personal preference is to use the two pieces I sleep with unattached. 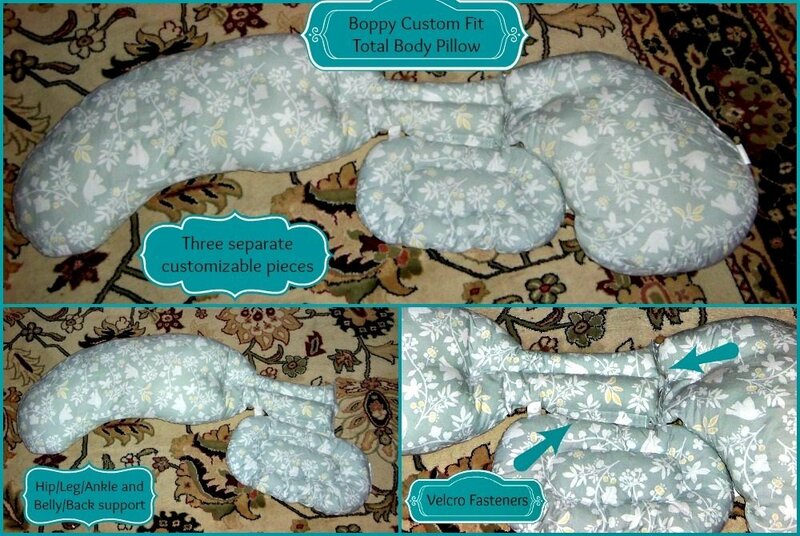 This is the great thing about the Boppy Total Body Pillow, you can use it how it is most comfortable for you! If the pillows are unattached, I find that I have more freedom of movement, and can adjust them to fit my body size. This has been by far the best pregnancy option I have used to date. I am on my third child, and with my first and second I had used a one piece body pillow but it wasn’t nearly as comfortable as the Boppy. With the Boppy I love that I can fasten or unfasten the pieces as needed so that I am in the most comfortable position. I also feel the pillows are really soft and comfortable, yet still offer enough support where I need it. The belly support isn’t so big and bulky to where it feels like a nuisance, it is just the right amount of cushion so my belly can be slightly propped off the bed. And another huge thing….the pillows are machine washable! I haven’t attempted washing them yet, but they seem to be well made and I think they will hold up well in the wash. I have been sleeping comfortably with this pillow since the beginning of September and I couldn’t be happier with it (I’m currently 32 weeks pregnant). If you want to sleep comfortably during your pregnancy (or even beyond), I highly recommend giving this pillow a try. The newly-designed Boppy® Custom Fit Total Body Pillow was developed with a physical therapist to provide customized support throughout your pregnancy. The flexible, three-piece design means you can use the combination that works best for you. Choose from: Head/Neck Support, Belly/Back Support, and Hip/Leg/Ankle Support. Extended length design provides support all the way down to your ankles, alleviating strain on hips. Machine washable for easy care. You can find more information and product demos by visiting the Boppy website, or take a look at the video below. Have you ever used a pregnancy pillow? What were your biggest struggles during your pregnancy? The Mommy Bunch was provided a free product to facilitate this review, all opinions are our own.